1 x Kamui Black Medium Tip. NO MINIMUM ORDER! Kamui Black Tips are specially selected 10 layered pig skin.The leather is tanned by a special moisture proof tannin. 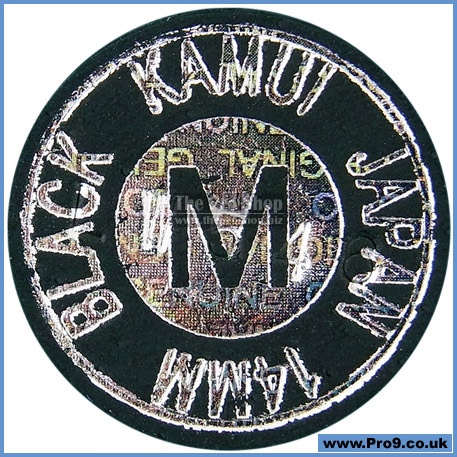 Giving the Kamui Black the black color and making it "humidity resistant". Kamui Japan found the way to apply this process without interfering with the porosity, adding more elasticity to the KB tip and protecting the tip from the environment. 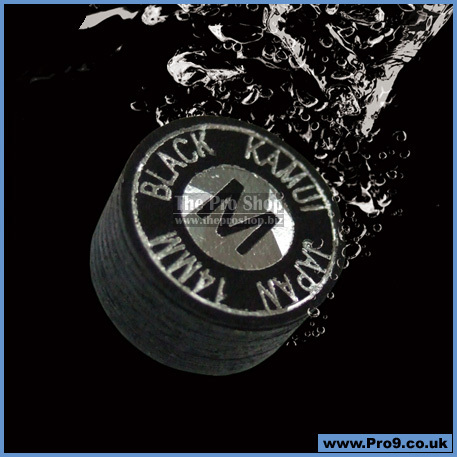 What you should expect from the New Kamui Black Tip is: Longer Durability, More Elasticity - Allowing more spin (grip) on the cue ball without overexerting yourself. And the KB tips have the same ability to grip onto the chalk which transfers to gripping the cue ball. KAMUI has developed five key points of playability, KAMUI believes that these five key points will provide total trust in your game. The New KAMUI Tip is standardized to 4 different hardness ranges. SS, S, M, H. You can find either hardness in the Original or Black KAMUI tips.The New KAMUI Tips have special foil stamp identifier to clearly see the diameter of the tip as well as the hardness of the tip. The combination of serial number and the new foil stamping is protection from counterfeiting. KAMUI tips are made of vegetable tanned leather.Vegetable tanned leather is a far superior process in durability and elasticity compared to chrome tanned leather. However, vegetable tanned leather has a tendency to absorb moisture which degrades the performance of the durability and elasticity. KAMUI introduced a special treatment in the tanning process to make the KAMUI leather humidity resistant.This specially treated leather maintains the elasticity and the durability of KAMUI tips in all seasons and even in high humid environments. The mushroom effect of a cue tip is due to the lack of durability from cue ball impact. 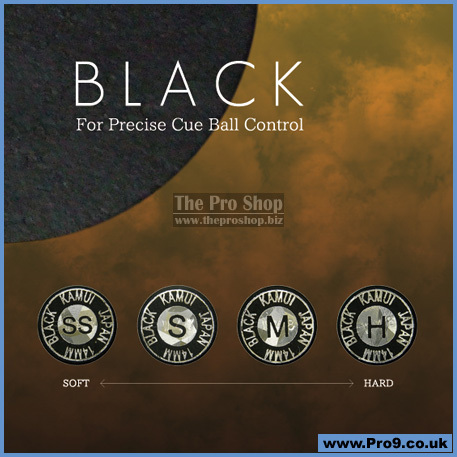 A mushroomed tip does not allow you to apply accurate english on the cue ball.In the tanning process of KAMUI leather, the process is frozen at a certain point to get the high durability against mushrooming.Also, KAMUI Tips are made of the finest boned fibre available today. These efforts of increased durability and elasticity has resulted in less mushrooming of all KAMUI Tips. Peformance stability is very important when choosing a good cue tip. It is difficult to play consistent when a new tip does not feel the same as the last tip you had before. 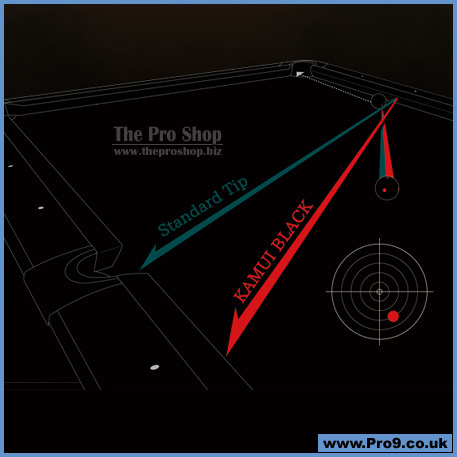 KAMUI is dedicated to improving the conventional quality control method.By collecting large amounts of　data and　developing a process of consistency, KAMUI has managed to maintain the best quality control seen in the billiard tip industry.KAMUI tip performance now allows playability and reliability on the table under any circumstances. The quality and the performance of leather is a very important point to produce high-performance cue tips. KAMUI has introduced a new special method of testing leather for its composition and reaction of vegetable tanning in detail.KAMUI is now working on bringing a greater synergy among the new inspection methods and the old-school trade talents of leather craftsman for the ultimate quality control of KAMUI leather.